The SLS AMG Mercedes Benz E-Cell in Detroit, Michigan. Low gasoline prices mean cars are out and pickup trucks and SUVs are in — for now. As the annual North American International Auto Show opened last month in Detroit, car sales account for only one-third of the North American automobile market. SUVs have increased their market share by 11 percent in the past five years and pickup trucks by 3 percent, while sedans have dropped 10 percent. The United States offers an extreme example of the shift away from cars, but it’s happening worldwide as customers trade in their sedans for SUVs and crossovers. Our research suggests that 15 to 20 percent of the light truck market — as many as 3.4 million vehicles — might swing back to cars if prices rise high enough. Will consumer tastes change, for instance, when more moderately priced options in electric vehicles become available in the United States over the next few years? Or when fully autonomous vehicles begin to hit the road in earnest sometime in the next decade? The answers are far from a slam-dunk, and automakers need a strategy to deal with the current level of market uncertainty. U.S. automakers are entering an interim period in which they may have to wait for Americans to catch up with the Chinese and Europeans when it comes to their willingness to consider buying electric vehicles. 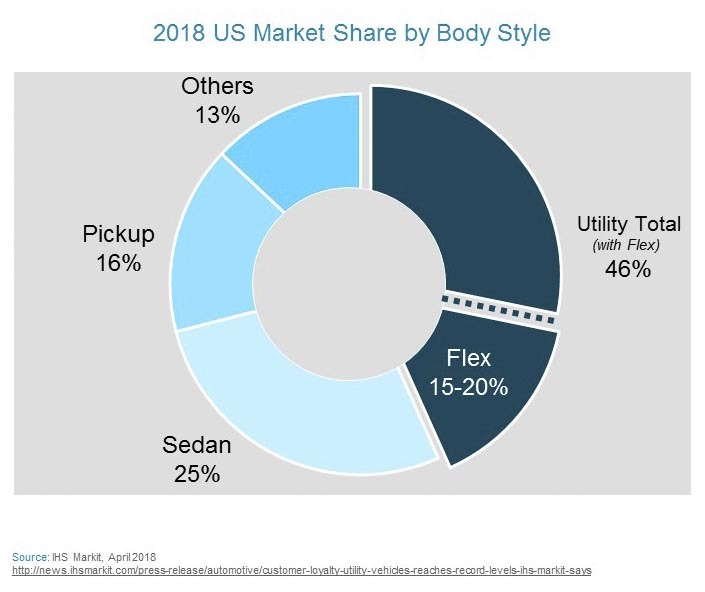 This means that car companies will require two market strategies: long-term tactics, focused on new technologies such as electrification and autonomy; and short-term tactics, based on remaining flexible and agile to accommodate a fluctuating market for their SUVs, pickup trucks and cars. The transitional environment will favor companies with manufacturing processes and vehicle platforms that — like the consumer — can switch between product lines without missing a beat. With so many uncertainties — gas price fluctuations, new Chinese producers, trade conflicts, climate change regulation and new technologies — the only way to avoid stranding investment capital may be to incorporate agility into every phase of production and design as a form of risk management. The transitional environment will favor companies with manufacturing processes and vehicle platforms that can switch between product lines without missing a beat. One of the first things manufacturers can do to gain flexibility is increase the number of shared platforms across vehicle lines. Thanks to the blurring of historical distinctions between cars and light trucks — which now share powertrains widely across segments — that kind of manufacturing convergence is much more doable and more efficient for plants. Modular design strategies, which help to standardize the vehicle platform, offer the ability to build wider varieties of vehicle sizes and types on the same platform. Modular platforms also can help automakers minimize time-to-market and enable greater global reach across brands and entities within a company. The 21st-century twist available with modular platforms is that they can serve both light trucks and cars where, in the past, it was one or the other. For instance, Toyota has launched a next-generation, highly modular platform in one of its biggest plants in the United States, which is currently only building cars. While many companies want to strengthen the links between product development and manufacturing, they are frequently vexed by rising complexity, customization and the fickleness of the buying public — a situation exacerbated by today’s shorter product life cycles and product portfolios that can include both traditional vehicles and electric vehicles. Each automaker will respond to risk differently, adopting modular platforms, consolidating product lines, or perhaps delaying action until the last minute. Whichever approach companies take, change is coming, and only those with agility baked into their production, design and organization are likely to win in this uncertain new environment.